This morning my husband surprised me with a beautiful bunch of flowers, an act of faithful and long-suffering affection from his heart to mine. He knows me very well after more than a quarter century at my side and this knowing includes an understanding for how much I appreciate the beauty of flowers and the Hand that created them. This month I have spent a lot of time re-reading Genesis, especially the first two chapters which I study almost daily. So drawn am I to the glorious description of Creation and how His own incomparable handiwork pleased the Lord because this was no small miracle, no small achievement. This was making a perfectly ordered, functional and breathtakingly glorious earth and solar system from nothing. You know it's very easy to be distracted by the issues of life, whether that be too much to do in too little time, over-commitment to others, health challenges, or even seasons of sadness, boredom or repetitive drudgery. Most of us at some time have life distractions which seek to draw our thoughts to the difficulties we may be facing, dwelling on them until all vision of the goodness we have, right here, right now, fades away. Just like in the Creation story, our Father speaks light and life into the darkness we face. There is no darkness He cannot dispel, no situation He cannot stand beside you in, no prayer from your heart left unheard by His ears. And just like these flowers today lifted my spirit with their delicate God given beauty, time with the Lord appreciating His power and creative handiwork in nature, making something exceptional out of nothing, is often the only tonic a downcast soul needs to find it's way out of the valley. This same God made you, knows you, cares for you, far more than He cared for creation. 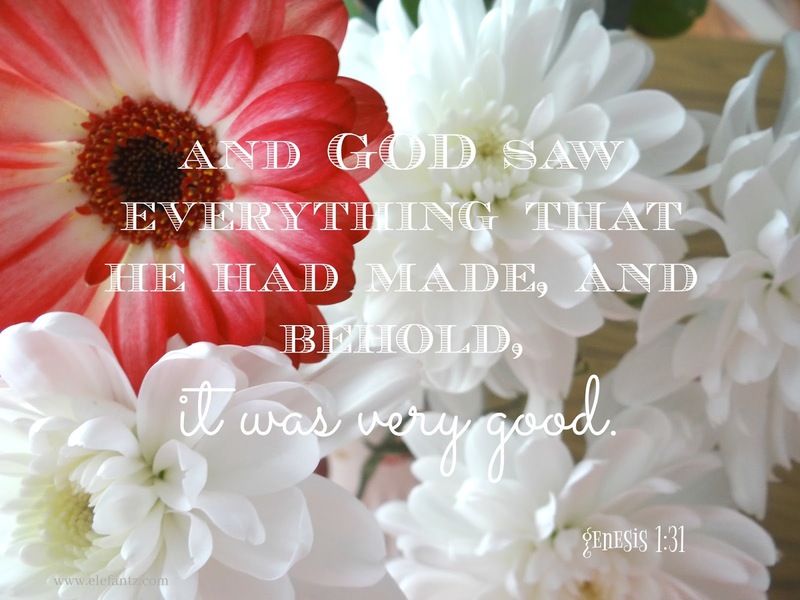 Take heart dear friend, look around at the beauty which surrounds your place in life and let the Lord overflow your spirit with His perfectly wonderful 'very good'-ness. Lovely words, Jenny...and so true. You are so fortunate to have such a devoted hubby. I loved reading about your husband's kind and loving ways. Thank you for sharing your thoughts today. I have been reading from Genesis this month too. I bought a lovely 'read the bible in a year' journal to guide me. So at the moment my daily bible reading is from Genesis, Matthew and Psalms. Beautiful, uplifting, elegant words, Jenny. Thank you. Thanks, Jenny. Creation was my theme, today, too. =) I think it's such a joyous thing that He shares His creation with us, and also shares the ability to create beauty!